BEAVERTON, Ore. (May 3, 2010) – NIKE, Inc. (NYSE:NKE) today unveiled its supercharged Nike Elite Series football boots providing new levels of performance. Nike’s Mercurial Vapor SuperFly II, CTR360 Maestri, Total90 Laser III and Tiempo Legend III all feature new performance upper to improve on-field visibility and a reengineered outsole to deliver lightweight performance for every style of player. 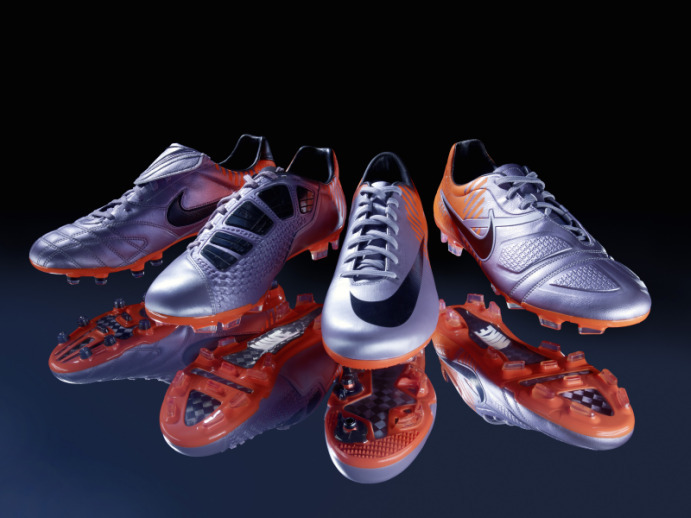 Nike designers have reduced the weight of each boot so players can perform at their best. Lightweight construction, intricate engineering, carbon-enforced strength and high contrast colors distinguish the boots. The high contrast colors (Metallic Mach Purple and Total Orange) are engineered together for enhanced visibility. For a footballer this unique combination is designed to increase visual performance enabling them to quickly spot their teammates and execute a game-changing pass. Interview with Andrew Caine, Nike Design Director for Football Footwear on the "Elite Series"
“At Nike, we have a relentless focus on product innovation to give athletes a real competitive edge and deliver the best products in the world,” said Andrew Caine, Nike Design Director for Football Footwear. “The Nike Elite Series delivers lightweight and highly engineered boots for the leading players in the world to perform on the biggest stage this summer”. Research shows that the average energy expenditure of an elite player is over 1,000 Kilo Calories per game for a 75kg player. Reducing the weight carried by players helps reduce the energy needed over the course of 90 minutes. By delivering lightweight supercharged performance to all four of Nike’s statement level boots the goal is to give players an edge in the final stages of a game. With nearly four years of game analysis, biomechanical studies and player testing the design team and Nike Sports Research Lab (NSRL) collaborated to understand how to deliver new product innovations including incorporating visual performance benefits into boot design. An average person’s vision is 99% peripheral. Under 1% is considered foveal, or focused vision. To spark increased focus of peripheral vision Nike designers analyzed the color spectrum to identify two, high-contrast colors, so that when a player is running with these boots the colors trigger a stimulus to rapidly tune peripheral vision. Mach Purple and Total Orange provided the perfect blend to create this effect and performance advantage. The Elite Series is available to players at all levels and also incorporates Nike Football+ which features exclusive insider access to the world’s best coaches, players and teams for total game improvement. Nike Football+ Master Series builds expertise in Control, Accuracy and Speed through elite insights and pro training. This includes a special Elite Series signature move from Atletico Madrid and Argentina star Sergio Aguero that will launch at the end of May. All four Elite Series boots, the Nike Mercurial Vapor SuperFly II, Nike CTR360 Maestri, Nike Total90 Laser III and Nike Tiempo Legend III, are available at retail and at www.nikestore.com as of May 22, 2010. 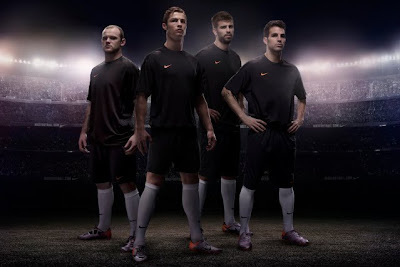 For more information including multimedia, visit http://www.nikemedia.com. I saw that you link exchange with other websites, so I was wondering if you would like to trade links with us, our website is page rank is 2 and good ranking in Alexa. Please let me know where you added my links (your website reciprocal link) and your website info so I'll add your link to my pages as well.